Dimensions: 8-1/2 x 11 in. 96 pages. Comes with 2 pairs of 3-D glasses embedded in front cover, for ages 7-14. Hardcover. 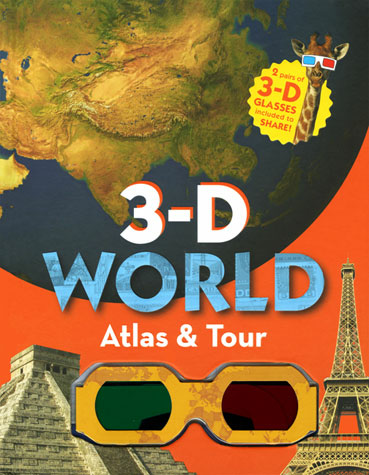 Much more than an atlas, this book is a virtual travel experience! It includes more than 40 maps, 30 feature articles on impressive places, and more than 50 eye-popping 3-D photos of the world's most interesting sights. Readers visit the Grand Canyon, look down from the top of the Eiffel Tower, "snorkel" in the Great Barrier Reef, peek inside a blue ice cave in Antarctica, and more! Physical maps are also rendered in 3-D, so mountains bulge out from the page.